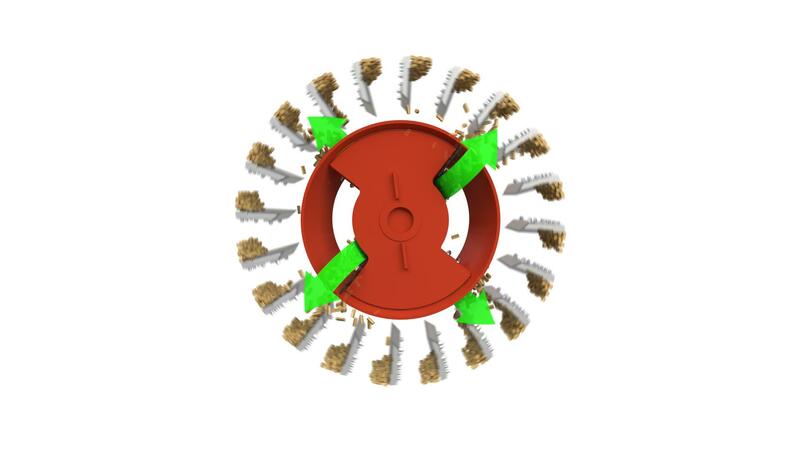 The FlowOptimizer is a distribution rotor integrated into the flaking chamber, enabling 3-D material distribution. EPPINGEN, Germany – Dieffenbacher’s new FlowOptimizer is designed to address the material distribution problem and ensure optimized flake quality while simultaneously reducing operating costs per ton of material produced. The FlowOptimizer is a distribution rotor integrated into the flaking chamber, enabling 3-D material distribution. The axially blown-in chips enter the inner chambers of the distribution rotor, are set into rotation and are guided via centrifugal forces through the openings at the front and rear side of the system toward the main rotor. Inhomogeneous material distribution is a problem of all knife ring flakers currently on the market. The material often impacts the knives of the knife ring only at a relatively limited zone. As a result, the entire knife length (knife ring width) cannot always be used evenly. Based on laboratory tests, a pilot machine was installed in a particleboard plant to test long-term operation under industrial conditions. Laboratory tests demonstrated that the material distribution in the flaking chamber could be substantially enhanced. Additional machines will be equipped with FlowOptimizer technology. The new FlowOptimizer is mounted with bearings in the flaker door, making the retrofitting of existing machines very simple: Only the door with the distribution rotor and heavy particle separator must be replaced. The FlowOptimizer will be available as an upgrade for existing flaker systems and as a standard component for the latest generation of Maier MRZ knife ring flakers, according to Dieffenbacher. Also, Thai company S. Kijchai Enterprise PCL in Rayong has produced MDF boards from a Dieffenbacher plant for the past five years. The company is now expanding its production capacity and adding THDF boards to its product portfolio. Kijchai's order is the fifth CPS+ project in Thailand in just two years. In addition to the 28 m long continuous press, the scope of supply includes the dryer, Z-sifter, forming station, Dieffensor, triple diagonal saw and raw board handling, along with a storage system. In Germany, using recycled wood in the production of particleboard promises economic benefits as well as increased flexibility when purchasing wood. However, it also presents challenges, including fluctuations in the type of contamination, the quality, the size and the moisture content of the furnish. With the help of Dieffenbacher, Pfleiderer in Neumarkt, Germany, has addressed these challenges with a combination of screen and sifter technology and a sensor-based X-ray sorting process. The Dieffenbacher system provides greater reliability to correct the unavoidable fluctuations in the furnish material and the inherent wide mix of impurities, further optimizing subsequent flake preparation. Thanks to efficient cleaning, the complete material flow can be prepared using known flake technology. Particularly in the preparation of fine materials, emphasis was placed on minimizing wood losses while achieving the required degree of cleanliness in all particle sizes. The concept has also been successful in removing a high proportion of unwanted MDF fibers from the waste wood flow, which has increased plant availability in subsequent processes as well. When it comes to the secondary size reduction of oversized pieces, Dieffenbacher uses a size reduction system that cuts at a slow speed. In addition to the low specific electricity consumption, the technology is such that only a minimal level of dust is generated by the size reduction. The system operates continuously and has been designed by Dieffenbacher so that it can be integrated into the existing Pfleiderer plant structure very efficiently.